It's been said that downtown Memphis is the place where the Mississippi Delta begin, and whether you are a visitor, Memphis native, or elementary school student, the Cotton Museum is a great place to start an exploration of the Delta's history and our dynamic urban culture. Our Museum tells the story of how Memphis came to be. Engaging exhibits help visitors understand our city's place in time and explain how the art, history and music that is so important to our culture evolved from the confluence of people that were originally gathered here around the cotton industry. Memphis also has a rich musical heritage; blues and rock and roll, which began with the story of the south and cotton. Visitors will receive a brief introductory orientation by one of our docents before viewing the opening film in our history gallery. Our docent will be available throughout your visit to answer any questions. 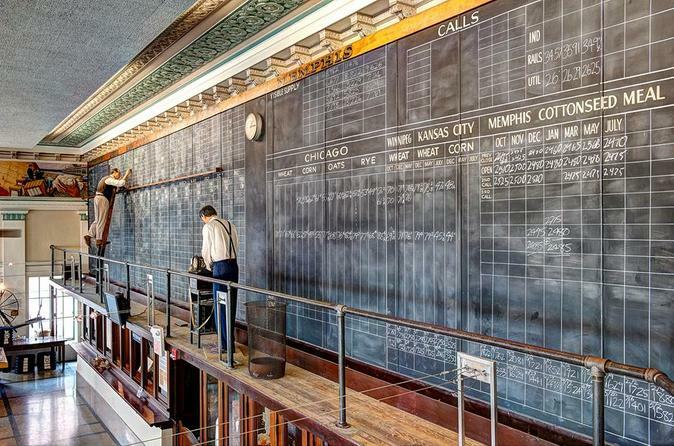 The main exhibit is located on the Historic trade floor of the Memphis Cotton Exchange where cotton traders once stood at the center of the global cotton economy. Highlights include original films, detailing specific aspects of the cotton industry, oral histories from individuals involved, and exciting temporary exhibits. Our award winning education wing, "Exploration Hall", explores cotton production, sustainability in agriculture, how technology in the industry has changed since the 1940's, and how that change has transformed American life and the Southern Landscape. Also included in your admission is a self-guided audio tour of Cotton Row. Memphis is the largest spot-cotton market in the world and, for generations, the historic Cotton Row district that surrounds the museum was the center of the worldwide cotton trade. The tour highlights historic landmarks and gives visitors a sense of the clamber and bustle that once surrounded cotton commerce in Memphis.